Nobody really enjoys a trip to the dentist. You can have games, books, and favors for the children, but how can you add fun for the adults? Dental office decor can make visits to your office more interesting, and help make people feel at ease. The right atmosphere can send a message of comfort, or even playfulness. Use these dental office decorating ideas and insights for inspiration. You will set your practice apart, and support it’s success! Research shows that plants can reduce stress. 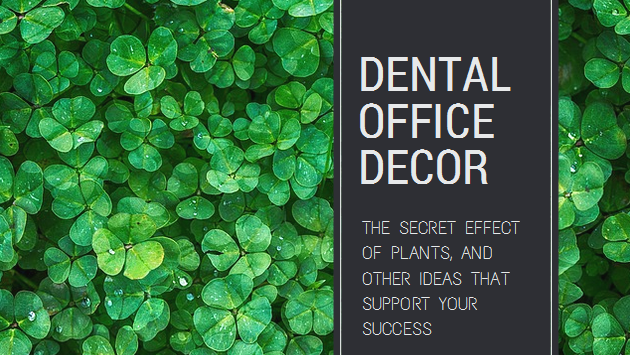 Yes, plants may be your most powerful dental decorations! Bringing in live plants helps add color and texture to the room, and adds oxygen to the air. Don’t have a green thumb? Here’s a dental management secret: pictures of plants are shown to have the same psychological effect as real plants! (And they are easier to dust than fake plants.) Alternatively, there are a number of indoor plants that don’t require a lot of maintenance, and work well in low-light waiting rooms. My favorite plants for fun dental office wall decor are air plants. If your dental office is filled with white walls, consider picking up the paintbrush. Research indicates white walls are often associated with a clinical appearance and institutional setting. If that is not your intention and you want a more welcoming environment, a colorful palette will help define your space. It can also have quite the impact on patients. Warmer colors and shades of blue are best. Being electronically updated means everything to the design of a good office. These days, adults and children alike turn to their devices in the same way that patients formerly sought out updated magazines. Putting WiFi in the office can be a great service to patients in the chair as well as those waiting for them in the waiting room. Set up a connection in rooms for musical selections. If a patient will be in the chair for a while, let him or her pick out a playlist on Pandora. Better yet, add HD TV with Netflix to patient rooms, like Skyline Smiles in Chicago’s West Loop. In addition to entertainment, the screen can be used to show x-rays and educate patients. Patients will find this invaluable, and it is still quite rare in dentist’s offices. Also consider setting up a Facebook or Instagram page for your practice. Encourage patients to post feedback about their experiences and photos of successful dental work. You can even help them with before and after photos for whitening or orthodontic work. Years ago, a study showed that patients recovered more quickly (and took fewer pain killers) when they could see trees from their window. While dental patients certainly don’t require overnight stays, the concept of “natural distractions” can be positive. A Chicago-area design company said one of their favorite projects “featured several dentists’ chairs positioned so clients had a view of the park-like setting outside (and dentists, hygienists, and assistants had ideal lighting for their work).” They note that as well as the setting, the lighting is important. Certainly, there are a number of dentists located in buildings that are located far from parks, trees, or even windows. In these cases, sky ceilings might be an option. Sky Factory in Iowa provides many views of the outside. As you consider designing or redesigning your dental space, you know you want it to showcase your practice in the best way possible. Not only do you need to communicate a friendly feel, but a professional atmosphere. Sometimes that can be difficult. If these dental decorating ideas have got you thinking, check out more examples of what has worked best for other dentists. Take a look offices around the world featured in Homedit Interior Design & Architecture, and the winners of the Dental Office Design Competition.